Hydraulic fracturing has boosted U.S. energy production while coming under scrutiny for its potential environmental impacts, mostly related to the wastewater the method generates. Now, a report in the ACS journal Environmental Science & Technology Letters takes a look at solid waste from horizontal gas wells. The study found that some well waste from the Marcellus shale in Pennsylvania contained radioactive material not previously reported, with the potential for leaching from landfills into the environment. Drilling horizontal wells for hydraulic fracturing operations results in a large amount of gooey solid waste, or drill cuttings. In 2011, natural gas exploration and extraction in the Marcellus Shale formation produced an estimated 2.37 million tons of cuttings in Pennsylvania alone with almost all of it ending up in landfills, according to a review published in Environmental Practice. A few studies have found naturally occurring radioactive materials in the solid waste, but the research only focused on several long-lived radioactive isotopes including uranium-238 and radium-226. Andrew W. Nelson and colleagues wanted to investigate whether other radioactive isotopes might be in drill cuttings and whether they could impact the environment. The researchers devised a method to test the drill cuttings from horizontal wells in the Marcellus Shale in Pennsylvania. In addition to uranium-238 and radium-226, the researchers report the samples contained elevated levels of the environmentally persistent radioactive isotopes uranium-234, thorium-230, lead-210 and polonium-210. A simulation of leaching over a range of acidity levels suggested that at low pH, uranium isotopes readily leached from drill cuttings, which raises questions as to whether uranium will seep into the environment from a landfill. Other isotopes appeared less leachable under the conditions tested. Leaching for all radionuclides declined as pH increased. The researchers say that because they were only able to obtain three samples from one well, the findings aren’t generalizable. But, they add, their study demonstrates that further testing is needed to understand what is in solid waste from the country’s proliferating horizontal wells and whether it might pose any environmental risks. The authors acknowledge funding from the Center for Global and Regional Environmental Research at the University of Iowa. 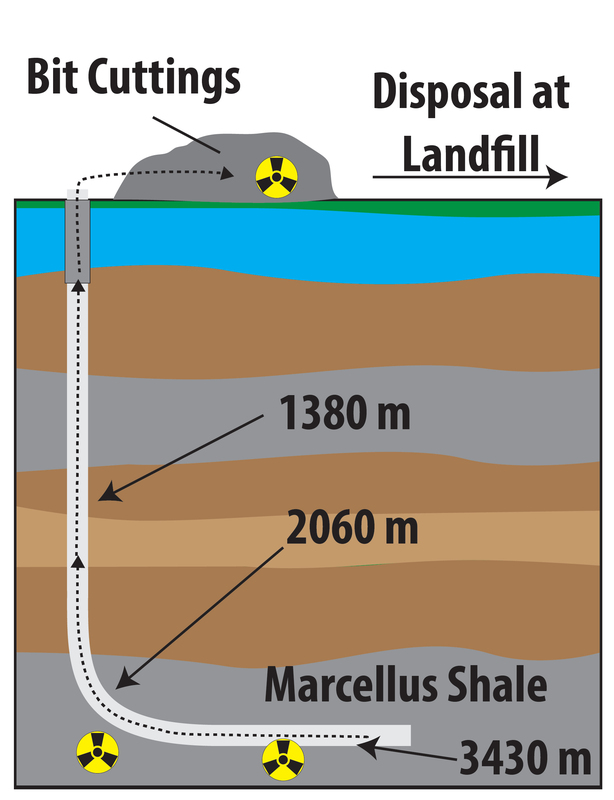 Solid waste from horizontal gas wells contains radioactive material that ends up in landfills.